Combining enjoyment with a balanced diet ! Vegetables to enjoy to your heart’s content ! At Créaline, we have been fostering a passion for vegetables for over 25 years and are constantly striving to make your day-to-day life easier. When it comes to combining enjoyment with a balanced diet that doesn’t involve watching what you eat, we are keen to offer you the tastiest and most delicious of recipes made from seasonal vegetables to satisfy your every craving, including creamy mashes and a range of vegetable stews that maintain all the original flavours and properties of the vegetables they contain. Get down to your local supermarket and give our delicious, balanced and practical seasonal recipes a try! The inimitable flavour and creaminess of our vegetable purées, which you’ll find in your local supermarket, mean that you can enjoy all the benefits of a healthy, balanced diet without spending hours in the kitchen. 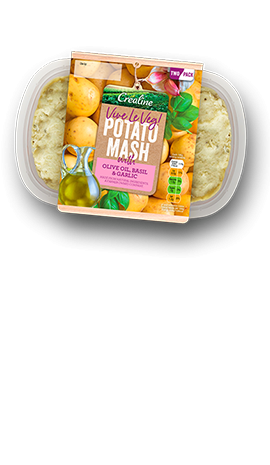 We create hearty, home-style seasonal purées and potato mashes for you to enjoy fresh all year round, using no additives and only 100% natural ingredients to create a tasty and indulgent product ! Check out our range of cooked vegetables in your local supermarket, with fragrant recipes that will take your taste buds on a journey. Succumb to our range of stewed vegetables, produced from hearty recipes and cooked in a pot for a real moment of indulgence! 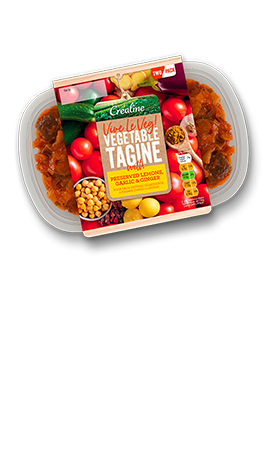 As always, Créaline’s delicious Ratatouille and Tagine recipes are additive and preservative-free, allowing the authentic flavours of the ingredients to really shine through !